Shiveluch is one of the biggest and most active of a line of volcanoes that follow the spine of the Kamchatka Peninsula in easternmost Russia. The volcanoes and peninsula are part of the tectonically active "Ring of Fire", a zone of active volcanoes and frequent earthquakes that nearly surrounds the Pacific Ocean. Shiveluch rises from almost sea level to a summit altitude of 3,283 meters (10,770 feet), and it is often capped with snow. In this image, from July 10, 2007, however, the full volcano is visible. The dull brown plume extending from the north of the volcano summit is most likely a combination of ash and steam. The two larger white plumes near the summit are dominantly steam, which often forms as rain and melted snow percolate down to the hot interior of the volcano. The sides of the volcano show many eroded stream channels. The south slope also reveals a long, sloping apron of collapsed material or pyroclastic flows (hot clouds of ash, rock fragments, and gas). Such debris flows have repeatedly slid down and covered the south side of the volcano when the summit lava domes exploded and collapsed. This type of event occurred during major eruptions in 1854 and 1964. Regrowth of forest on the south slope has been foiled by the combined effects of continued volcanic activity, instability of the debris flows and the short growing season. 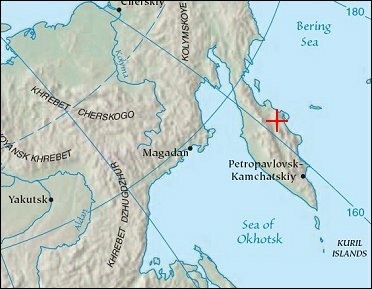 Shiveluch sits at the intersection of the Kamchatka volcanic line, which runs northeast, and the Aleutian volcanic line, which runs northwest. Junctions such as this are typically points of intense volcanic activity. 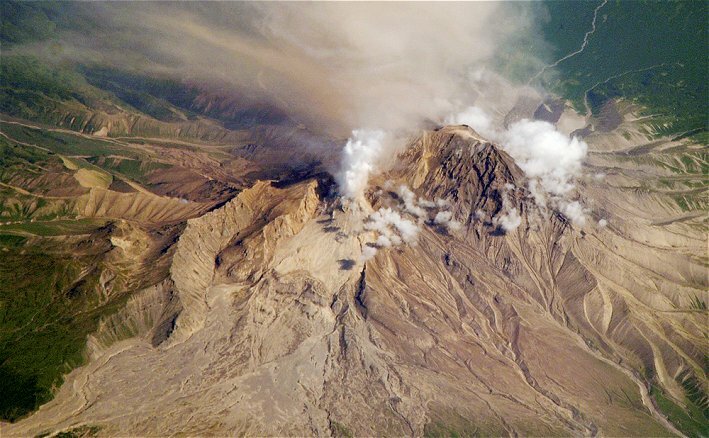 Lava layers on the sides of the volcano reveal at least 60 major eruptions in the last 10,000 years, making it the most active volcano in the 2,200-kilometer distance that includes the Kamchatka peninsula and the Kuril Island chain.